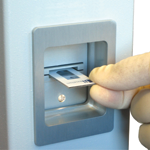 With the Cellometer Vision CBA, just 20 µl of sample is added to the Cellometer Counting Chamber. Imaging and analysis of GFP expression is completed in less than 60 seconds. Bright field and fluorescent cell images can be viewed to check cell morphology and verify cell counting. Total cell count, concentration, and mean diameter are automatically displayed. 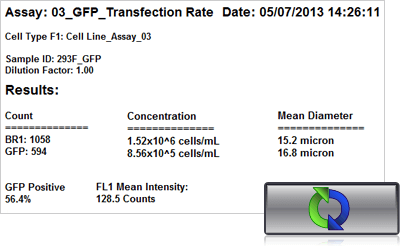 Automatically measure the number and percent of GFP positive cells in the population. Automatically measure the number and percent of RFP positive cells in the population. Monitor cell health by adding PI to the GFP expression assay. The number and percent of the dead, PI positive cells, are shown along with the GFP expression readout. 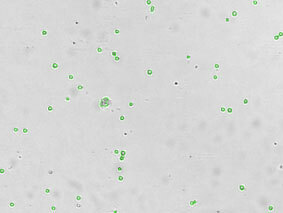 Image and Analyze double positive GFP/RPF cell populations. 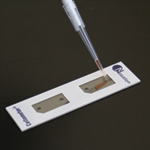 The Cellometer automatically reports each population as well as number and percent of dual positive cells. Export and analyze Cellometer captured data in flow cytometry software FCS Express. By plotting the mean fluorescent intensity of the GFP signal we can determine the percent of GFP positive cells in the primary bone marrow sample. For Cellometer Vision CBA, customizable fluorescent optics modules are available for specific fluorescent proteins. Shown here are several examples of GFP expressing cell lines. 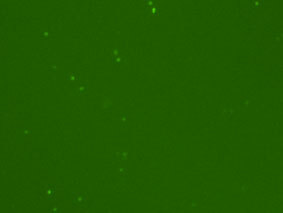 A bright field and a GFP image was collected for each cell type. 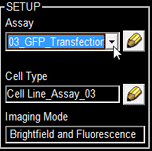 Cellometer image cytometry may be effectively utilized to determine GFP or other fluorescent protein transduction/transfection efficiency. Furthermore, it may be used to study not only GFP-expressing mammalian cell lines, but also GFP-expressing yeast cells. This robust instrument platform along with separate software-solutions provides researchers with the ability to detect strong and weak fluorescent signals.